Say you have 50 items or shapes on the screen. It would take a while to add dimensions lines to each. With this macro you can dimension each shapes height and width at once or dimension the entire collection of selected shapes as a whole. Many options for dimension color, size, thickness, distance, positioning and layout. All options are remembered by the macro for future use. 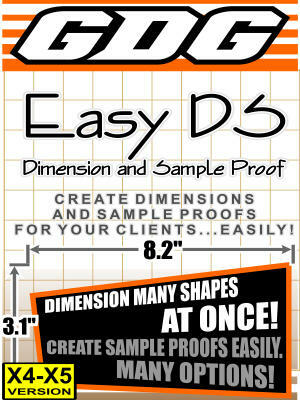 Also many options for creating instant sample proofs for your customers. This macro is a huge time saver for anyone who regularly sends proofs and samples to clients. This is the same macro previously known as GDG Easy Dim and Sample. It is now GDG Easy DS and considered version 3.0 and up. See flash demo video below. Note: This version is for X4 and X5 only.